Pros(e) of Pie - If you like The Moth, you'll love our pie!Pros(e) of Pie | If you like The Moth, you'll love our pie! Pros(e) of Pie is bringing you another first this May. Thanks to a new collaboration with the Hammond Museum in North Salem, we’re venturing inland a little farther than we’d normally dare. Join us for an evening of world-class contemporary storytelling – from around the neighborhood and across state lines – in the Hammond’s main exhibition hall. Fear not, you’ll have a chance to enjoy all their galleries before the show and during intermission. Or better yet, come even earlier to discover the many regions of their stunning Japanese stroll gardens. 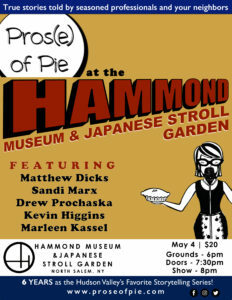 The Hammond’s generously agreed to open the gardens at 6pm for PoP ticketholders! *No pie bake-off this month. Light refreshments will be served. We’re returning to the gorgeous Hudson Valley Writers Center in April. If you haven’t been there yet, you’re going to love the wood-paneled walls of this former train station. Plus, they offer some of the best views of the Hudson and the new Tappan Zee Bridge. 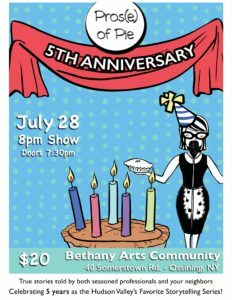 ***Please note, for logistical reasons, there’ll be no pie at this show. ABOUT THE SHOW: Join us to listen to seasoned storytellers and humor writers from around the region tell true personal tales on the monthly theme in a Moth-inspired format. You can sit back and enjoy the show or join the fun: sign up for a 5-mins open mic slot or submit an anonymous answer to a written prompt that we’ll read out loud for you. Either way, we’ll all be there to support and share. We sell out many months, so be sure to buy your tickets early! 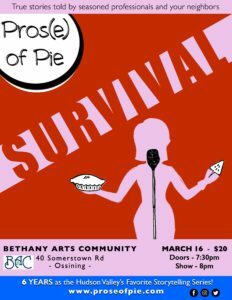 We’re kicking off another year at Ossining’s beautiful Bethany Arts Community with a SURVIVAL themed show. And we’re bringing you a great mix of returning PoP alumni and some first-timers we’ve been angling to get up here for some time. ABOUT THE THEME: Everyone’s had that moment. When despite the odds, despite all predictions, you persevered. Was it a truly life-altering experience, or momentary teen angst when a single phone call felt like life or death. No matter how serious, you made it out the other end, and now we want to hear all about it! ABOUT THE SHOW: Join us to listen to storytellers and humor writers from around the region tell true personal tales on the monthly theme in a Moth-inspired format. You can sit back and enjoy the show or join the fun: sign up for a 5-mins open mic slot or submit an anonymous answer to a written prompt that we’ll read off for you. Either way, we’ll all be there to support and share. 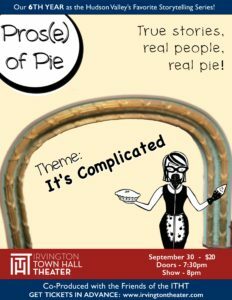 PLUS a pie bake-off: To start the evening, you’ll indulge in a sampling of pies made by local “pie-trepreneurs” and vote for your favorite between stories. You’ll please your belly and warm your soul. 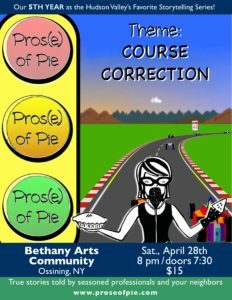 Entry fee includes pie tasting, beverages, and great entertainment! We sell out many months, so be sure to buy your tickets early! HAVE A PIE FOR THE BAKE-OFF? 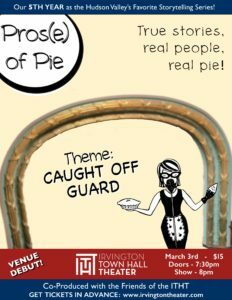 Admission is free if you bring a pie for the bake-off BUT YOU MUST NOTIFY US at least two days before to receive your free ticket. And if your pie gets the most votes, you win the prize and proudly bear the title of this month’s PieMaster! Halloween storytelling around here is like no other setting in the world. 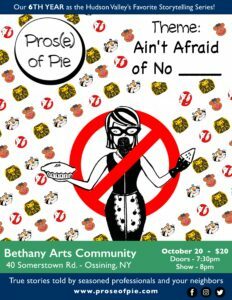 Pros(e) of Pie is delighted to be bringing our Halloween show back to our newest regular venue – Bethany Arts Community. And we’re having so much fun with this month’s theme: “Ain’t Afraid of No ____” An homage to the original Ghostbusters movie tagline that’s taught us all that facing your fears can be funny! ABOUT THE THEME: Everyone’s got a story about enduring a particularly scary situation or struggling with a lifelong phobia. Did a late night horror film keep you up worrying about the boogie-man? Maybe you were tormented by a boss-witch or schoolyard bully? Were you able to overcome or are you still fighting it? This month, we’re sharing tales of both fear and fearlessness, and getting through it together. ABOUT THE SHOW: Join us to listen to storytellers and humor writers from around the region tell true personal tales on the monthly theme in a Moth-inspired format. Prose of Pie has been the Hudson Valley’s most popular monthly storytelling series for over 5 years. After rave reviews for our February show, we’re again collaborating with the Friends of the ITHT to bring a new line-up of storytellers to the Irvington Town Hall Theater. This month’s theme: IT’S COMPLICATED ! ABOUT THE THEME: Life’s never as simple as we want it to be. Perfect families have their secrets. Unrequited love doesn’t get beyond fantasy. How did you keep things running smoothly when your simple plans were faced with endless hurdles? We want to hear about the complications you faced and how it all turned out. 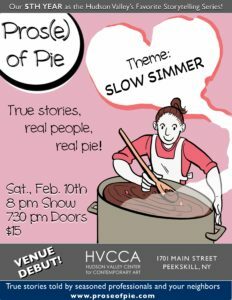 ABOUT THE SHOW: Join us to listen to storytellers and humor writers form around the region tell true personal tales on the monthly theme in a Moth-inspired format.PLUS a pie social: You’ll start the evening by indulging in a slice of tasty. Once your belly’s happy, the stories will warm your soul. Entry fee includes pie, beverages, and great entertainment! We sell out many months, so be sure to buy your tickets soon! FIVE YEARS! That’s how long Pros(e) of Pie been joining us for true personal tales told by friends, neighbors, and pros. We’ve taken you to barns, museums, historic theaters. Where will we go next? Thanks to all the storytellers, pie bakers, volunteers and fans who’ve helped us keep this wonderful series going. In July, join us at Ossining’s Bethany Arts Community to celebrate 5 years of storytelling in the Hudson Valley. Hear stories from people who’ve been with PoP since the beginning, as well as stars that have only recently joined fun. ABOUT THE SHOW: Join us to listen to storytellers and humor writers form around the region tell true personal tales on the monthly theme in a Moth-inspired format. Plus opportunities to participate if you dare! PLUS PIE: To start the evening, you’ll indulge in a taste of pie made by local “pie-trepreneurs”. You’ll please your belly and warm your soul. Pros(e) of Pie, the Hudson Valley’s favorite storytelling series, is collaborating with Historic Hudson Valley and its Women’s History Institute to bring you you another installment of storytelling magic. The 1700s barn at historic Philipsburg Manor will be the setting for an unforgettable evening of stories by and about DEFINING WOMEN. ABOUT THE THEME: Women have been an untold part of the story for hundreds of years–as uncredited players pulling the strings behind closed doors, influencers, sufferers, nurturers, leaders, and –let’s face it–sometimes tormenters. Women’s stories are being discussed and celebrated like never before… and we’re only just beginning. Whether forging one’s own path or struggling under societal definitions, these stories will reveal what it means to be woman at the start of the 21st century. Come early to stroll the grounds of this historic farming estate or take a tour of the colonial era manor house. Free with your PoP ticket! *No pie bake-off this month. Beer, wine, and pie will be available for purchase. Prose of Pie has been the Hudson Valley’s most popular monthly storytelling series for nearly 5 years. Our January show was such a hit that in April we’re returning to the new Bethany Arts Community. Once again, we’re filling their former chapel with a range of true human experiences. The evening will feature renowned storytellers and rising locals sharing their tales on this month’s theme: COURSE CORRECTION! ABOUT THE THEME: Sometimes you have to accept that it’s time to make a move. Did you set off on the wrong foot? Did life throw too many obstacles in your path? The best laid plans just aren’t meant to be. Or, were you on the wrong road along and finally making a change for the better? Did you drag your feet too long before doing what you knew had to be? Did you make the leap eagerly or go kicking and screaming? Life, love, family, therapy. This month, we’re sharing all your stories of change, whether or not your were ready for them. 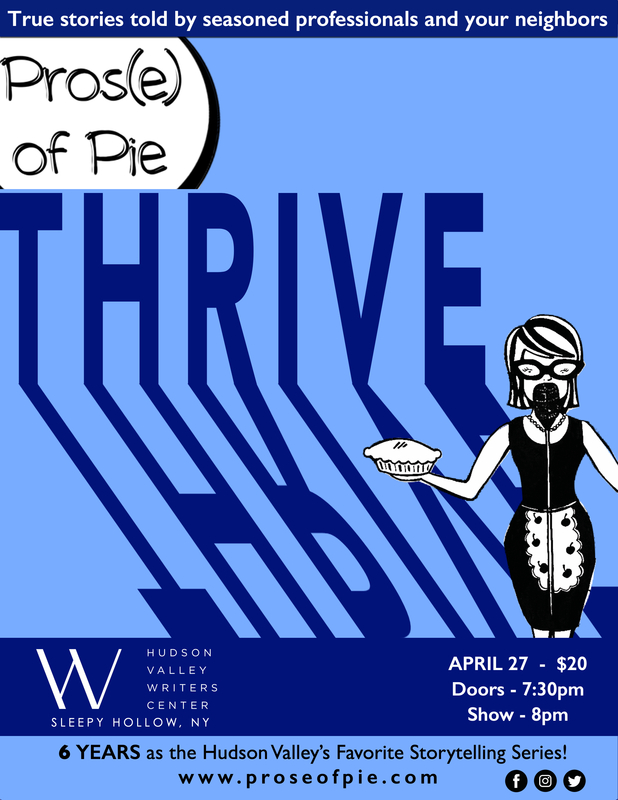 Prose of Pie has been the Hudson Valley’s most popular monthly storytelling series for over 4 years. In March, we’re collaborating with the Friends of the ITHT to bring our show to the Irvington Town Hall Theater for the first time. Did you know the theater is a replica of the one Abraham Lincoln was shot in? How appropriate of our theme this month: CAUGHT OFF GUARD ! ABOUT THE THEME: We’ve all had surprises. They can be the best or worst thing imaginable. An act of kindness that warmed your heart. A medical scare that changed your forever. The prank that you’re gang is still talking about twenty years later. We want to hear how you faced the unexpected and how it all turned out. PLUS a pie social: To start the evening, you’ll indulge in a taste of pie made by local “pie-trepreneurs”. You’ll please your belly and warm your soul. For logistical reasons, this evening’s pie service will be a pie “social” rather than a bake-off. Everyone gets to enjoy one slice of pie with admission. There’ll be no voting on pies tonight. Admission is still free if you bring a pie BUT YOU MUST NOTIFY US at least two days in advance to receive your free admission. 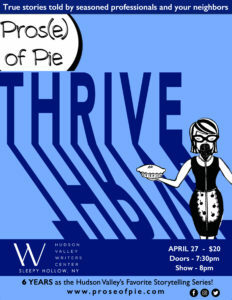 Prose of Pie has been the Hudson Valley’s most popular monthly storytelling series for over 4 years. In February, we’re bringing you a brand new collaboration with the Hudson Valley Center for Contemporary Art. HVCCA is the region’s premier museum for contemporary art and its relationship to social issues. We’ll be filling their beautiful exhibition space with true human tales on the evening’s theme: Slow Simmer. Soak in the stories surrounded by the best contemporary art on view in the Hudson Valley. ABOUT THE THEME: Sometimes passion takes time. Remember how long it took you to get up the nerve to approach that crush! What was it that led you to fall in love with an artist, or make art your life’s pursuit? How long did it take to master your field of expertise, or maybe you still ‘fake it til you make it’? Did you find a hobby that makes the rest of life bearable? An enduring commitment to making the world a better place or was it an infatuation long past? It takes time to fall hard – for a partner, for your calling, for a pastime. We want to hear about the long slow road you followed on the way to your passion.